Georgia Home and Commercial Products. Homebuyers put a premium on organized storage space that provides imaginative combinations of space and style ...luxury and livability. Georgia Home and Commercial Products offers the finest in closet organization systems - MasterSuite - manufactured by ClosetMaid, the long-time leader in home storage solutions, takes pride in offering outstanding quality at an affordable price with MasterSuite, our expanded line of laminate storage systems for closet, pantry, garage, laundry and basement. Welcome home to MasterSuite and Georgia Home and Commercial Products. 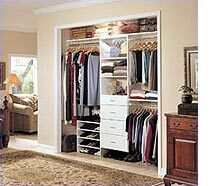 Only ClosetMaid, through Georgia Home and Commercial Products, offers such an extensive line of storage products. The MasterSuite program is available in several exquisite finishes. Natural Maple, with raised-panel doors and drawers, accentuates the beauty of the room's architecture. 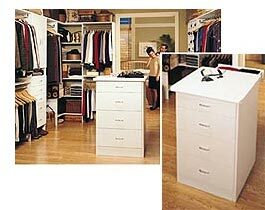 Clean white with raised-panel doors and drawers offers a subtle elegance to any storage space. And our original white program features smooth front panels to meet any taste or budget. Also available are Cherry and Walnut. Details matter. That's why ClosetMaid and Georgia Home and Commercial Products focus on the little things like hardware and accessories. Chrome poles and drawer handles add a sense of luxury. 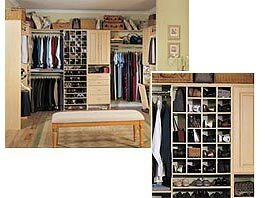 We also offer jewelry trays, tie and belt racks, valet rods and a variety of shoe storage options. MasterSuite is manufactured with the highest-quality thermal-fused laminate. Dowel-and-screw construction and heavy-duty European hardware ensure years of satisfaction. 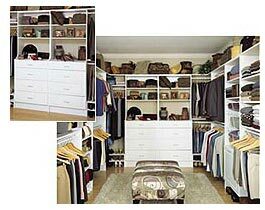 Yet MasterSuite costs up to 50% less than traditional custom storage systems. And ClosetMaid's Free Replacement Policy and super customer service can't be beat. Because ClosetMaid is all about choices, Georgia Home and Commercial Products can help you customize MasterSuite to fit your individual needs. Storage towers can be floor-mounted to provide the look and feel of a total custom closet or wall-mounted to keep floor space accessible. The kitchen is often the crown jewel of contemporary homes. 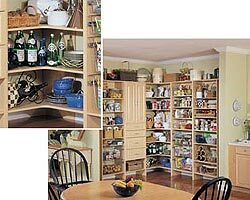 Functional, attractive pantry storage is a great upgrade for this center of activity and entertainment. Georgia Home and Commercial Products and MasterSuite provide the perfect combination of style and efficiency. 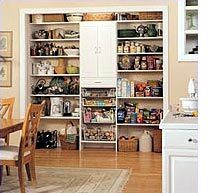 Cabinets, drawers, Designer Baskets and adjustable shelving help make the most of this valuable storage space. The look of a pantry needs to complement the styles of today's designer kitchens. White with raised panels offers a traditionally elegant look, while Natural Maple with raised-panel drawers and doors lends luxurious warmth to any kitchen. Original White with smooth-front drawers and doors has clean lines that match both contemporary and eclectic styles. All units include stylish, durable, solid, steel chrome handles. Raising your Standards for garage storage. Now homeowners can get what they want most in a garage - more storage, with a finished, custom look that complements the rest of their new home. 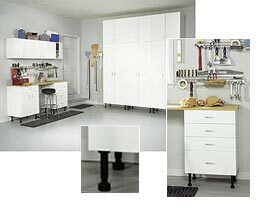 A MasterSuite Garage Storage System by Georgia Home and Commercial Products keeps things organized behind closed doors, where such items as tools and chemicals are safer and more secure. A variety of configurations can be designed to suit every homeowner. MasterSuite systems by Georgia Home and Commercial Products are sturdy, attractive and versatile. All units are constructed from solid 3/4" thick board. All surfaces are finished with durable melamine to protect against stains and moisture. Homeowners have peace of mind, knowing that everything in their garage, laundry or basement has a place, protected from dust, dirt and damage.